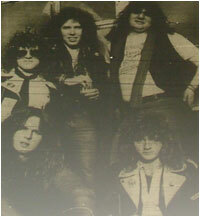 Caption: Tytan…before the addition of guitarist Gary Owens, Norman “Stormy” Swan is pictured front left. TAMWORTH vocalist Norman “Stormy” Swan has broken through to the forefront of the national HM scene and joined forces with two members of cult heavy band Angelwitch. The 19-year old ex- Mamma frontman beat off competition from established names in the music industry to get the coveted job. The new band will be called Tytan – spelled with a Y – and are due to make their debut in London in the next couple of weeks with a prestige date at the famous Marquee venue on January 29. Tytan have been put together by ex-Angelwitch members Kevin ‘Skids’ Riddles, bass, and Dave Dufort, drums. Rather than be labelled as another ‘New Wave of HM supergroup’ like the ill-fated Lionheart, Riddles and Dufort decided to scour the country looking for new members. The net result of this was the recruitment of Norman – who will be known as Kal for stage purposes and guitarist Steve Gibbs. Finding a second guitarist has been a problem until now, but finally they have settled on ex-A11Z axe-man Gary Owens. Norman originally went after the vacant Samson job when Bruce Bruce quit to join Iron Maiden and although he was unsuccessful guitarist Paul Samson was so impressed that he recommended Norman to Riddles and Dufort. For the last couple of months the band have been writing and rehearsing in London and Norman has written the lyrics for most of the numbers and some of the songs entirely himself. Ironically, in light of his rapid and impressive success, Norman never considered vocals as a serious career until he joined Hamma less that a year ago. “I’d always thought of myself as a guitarist not as a vocalist, until I joined Hamma,” he says. Norman, reckons Tytan’s music will be a long way from the demonic HM of Angelwitch. “It will have slightly more commercial appeal. We want to try to combine the harmonies of some of the top US bands like Foreigner with the raw edge of British rock,” he says. TAMWORTH music followers have their first chance to see local vocalist Norman Swan back in the Midlands this week-end at the summer’s first major festival. For Tytan, the band formed by Norman plus ex-Angel Witch members Dave Dufort and Kevin “Skids” Riddles and former A-11Z guitarist Gary Owens are one of the bands featured at the Monmore Rock open-air gig at Wolverhampton, on Sunday. TYTAN – the band fronted by Tamworth vocalist Norman Swan have lined-up their first tour of major British venues. The much heralded outfit are to support the Tygers of Pan Tang on a nationwide tour next month. And local fans can catch what should be a great double bill at Birmingham Odeon on September 15. THE FIRST two slabs of vinyl featuring Tamworth vocalist Norman ‘Kal’ Swan’s band Tytan are now in the shops. ‘Blind Men and Fools’ is the title of Tytan’s first single and is available on both seven-inch and 12-inch versions with the 12-inch featuring one extra track. The band’s first album is scheduled for new year release with the possibility of more British dates around Christmas. Having found a permanent drummer, the band are now looking for another guitarist to cement their line-up.